Shiraz by Penley Estate of Coonawarra. The youthful palate exhibits tight structure with good natural acidity, fleshy with a diverse flavour profile of berries, black olive, spices and smokey oak. A Coonawarra Shiraz of elegance and finesse, Penley's vintages are regularly awarded with prestigious international trophies and accolades, outclassing some of the nation's icon wines. 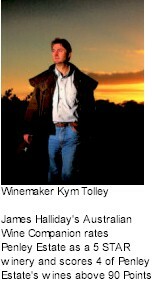 A direct descendant of two great winemaking dynasties, the Penfolds and the Tolleys, Kym continues to employ the best of traditional and modern winemaking techniques. The young tannins are quite dry, will soften and become more opulent, offering enough softness to be enjoyed immediately upon release.